Aren’t these cupcakes THE CUTEST?! 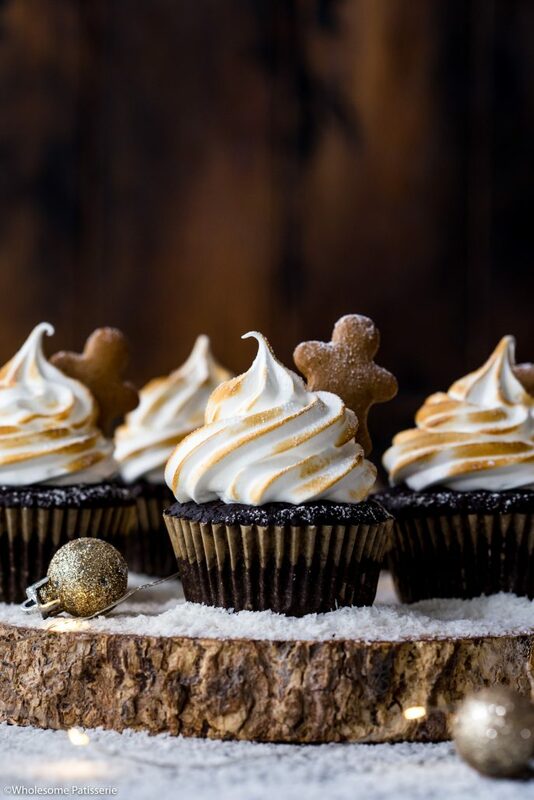 These are the epitome of Christmas in a cupcake and I’m SO excited to share this recipe with you! Using my favourite rich chocolate cake recipe, made into cupcakes, with a hint of peppermint! Classic flavours for a wonderful Christmas! The frosting? Well that’s my favourite part of these delicious cupcakes, fluffy soft meringue that been lightly toasted, salivating yet? Homemade meringue that’s heavenly with every mouthful. It’s a simple meringue recipe that I know you will be able to achieve. As these are frosted with meringue, they’re absolutely best served fresh. The meringue will last 2-3 days but will begin to melt (sugar begins to separate and melt out from the meringue). Keep them refrigerated! 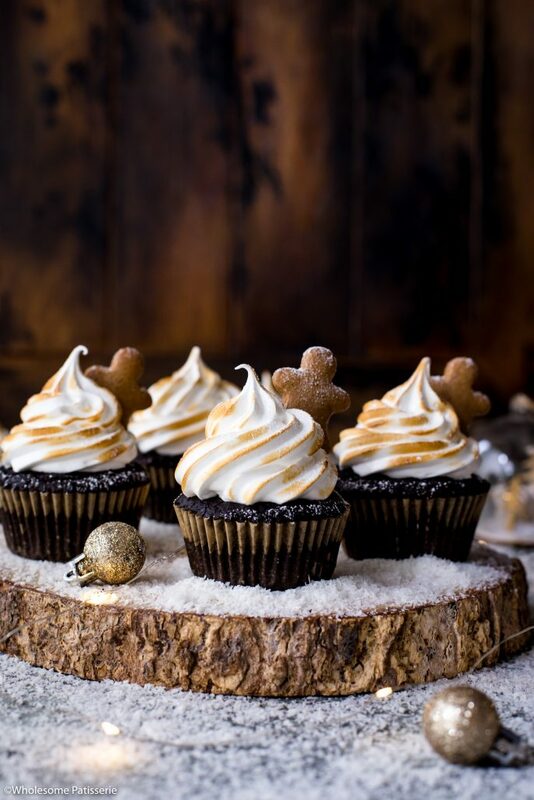 See those cute mini gingerbread men cookies poking out of that heavenly frosting? These are completely optional but aren’t they the cutest? 😉 You can top your cupcakes with store-bought mini gingerbread cookies or use my homemade gingerbread cookie recipe here. I love how easy that recipe is plus you can make yourself some regular sized gingerbread men cookies also, yay! 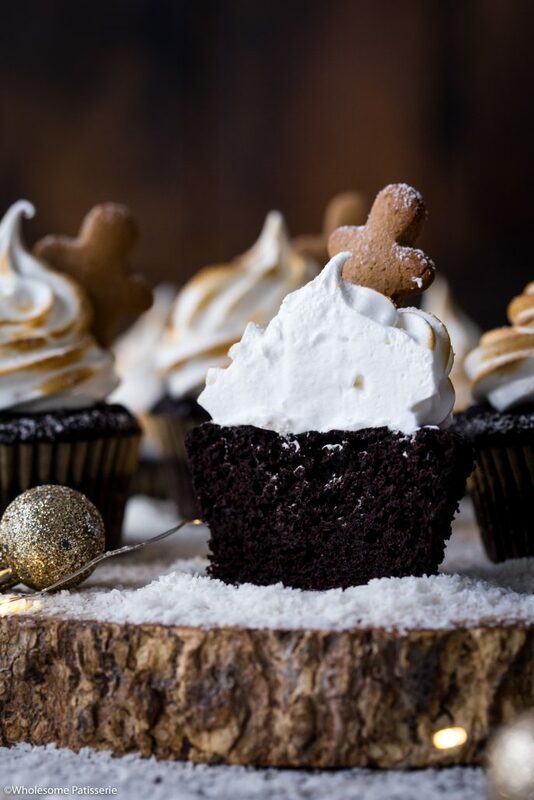 I hope you make and enjoy these chocolate peppermint and meringue cupcakes, they’re super fun to make and PERFECT for the festive season! Preheat oven to 180ºC (356ºF). Line a 12-hole regular cupcake pan with cupcake liners. Set aside. Whisk in eggs, sugar, oil and vanilla until well combined. Add 6 drops of peppermint, taste test and adding any extra if desired. Mix well. Divide batter amongst cupcake liners, filling each up 3/4 of the way full. Bake for 18-20 minutes or until the top bounces back when lightly pressed or a toothpick inserted into the middle of one cupcake comes out clean. Fill piping bag with meringue. Pipe meringue onto each cupcake. 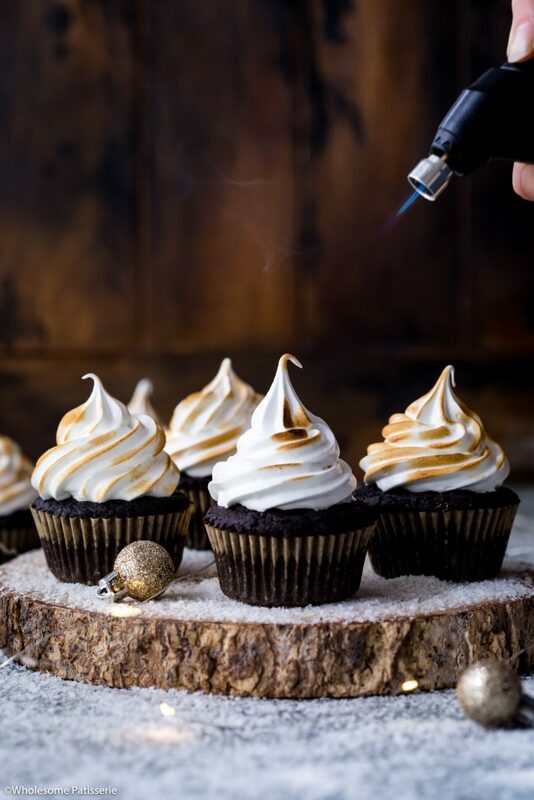 Take your blow torch and carefully and lightly toast the meringue frosting. If you don’t have a blow torch, simply pre-heat oven to 175ºC (350ºF). 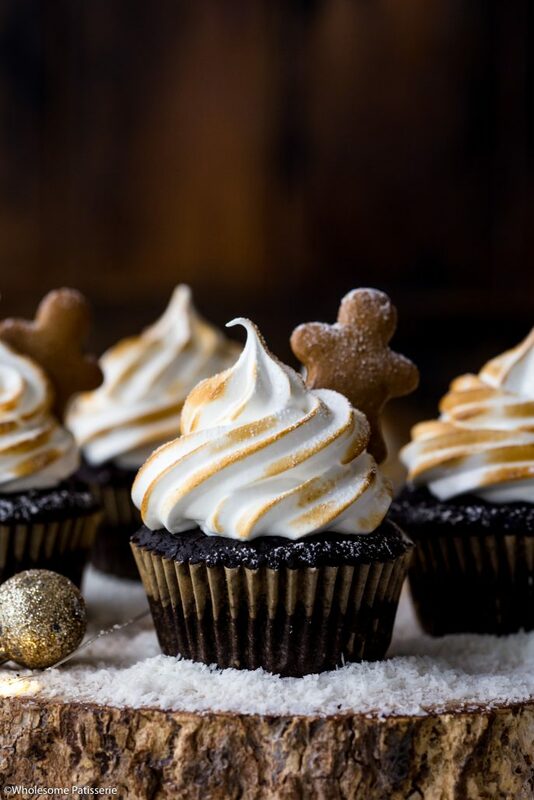 Once to temperature, place frosted cupcakes on a baking tray, place in the middle of the oven and bake for 10-12 minutes or until meringue is lightly browned. Remove and allow to cool. Optional: Top each cupcake with a mini gingerbread man cookie but gently placing him into the frosting. Store frosted cupcakes in an airtight container, refrigerated, for 3 days, or until the meringue begins to melt. Store unfrosted cupcakes in an airtight container, in the pantry or refrigerated, for 5 days. Are kids ok to eat meringue topping ? Without cook? For infants and young children, there is a risk with consuming raw eggs, so I’d suggest not exposing them to potential illness linked with raw eggs. I would strongly suggest that you consult your healthcare professional about your options. Can a 1/2 cup of gf flour be substituted for the almond meal? Can white sugar be used istead if coconut sugar?